It's been too long since my last post. Sometimes life gets busy and you find you're just too shattered on an evening to string two sentences together. 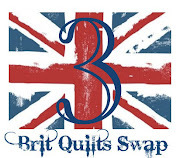 The Brit Quilt Swap 3 finished a few weeks ago. My Insane Geese Posse found its' way up to Scotland and Sadie. Here are some pictures of the finished product! I had a lovely time making this and Sadie seemed to be over the moon at receiving it. Coming up next I'll post some pictures of the one the I got in the post! Oh I think there were a few too many ladies heartbroken they didn't find this one in their mailbox! 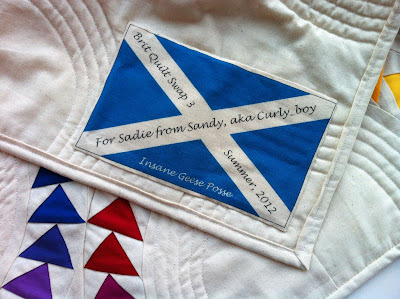 It really is fantastic and Sadie is a very lucky swapper :). What a gorgeous quilt! I'm glad that I found you from a comment on Lily's Quilt blog. I came to inform you that there are most certainly bears in America's Midwest, which is where I live. To see lots of photos of them, do a search of "Missouri Black Bear". how beautiful ..............i have the geese printed out to start i think yours has just given me the jolt to do them thanks !! Wow, it's really beautiful - and the quilting is inspired. I recently bought some rainbow fat quarters so you've given me food for thought:-) Thank you for joining the Slow Blog Linky! Thanks and good news! 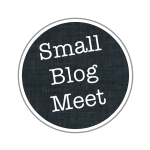 I've made the templates available for free on a later blog post. What lucky partner. that is beautiful, love the design and the colours. The way you've quilted it really brings out and complements the design.